What the students have to say! 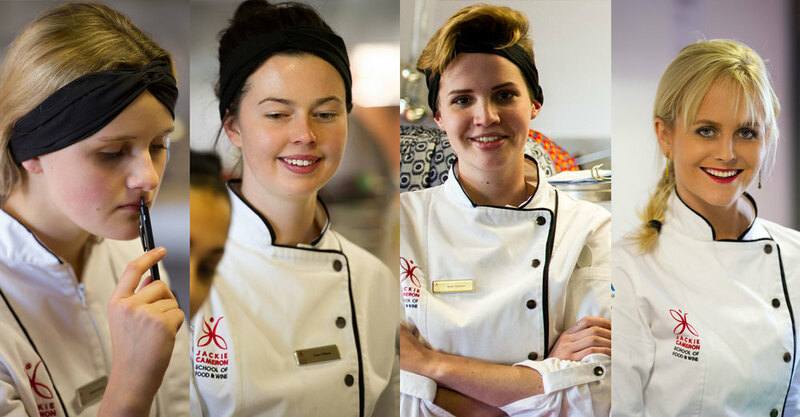 What’s the one most important realisation you’ve had in your first year at Jackie Cameron School of Food & Wine? Before starting my journey to become a chef so many people said: “It’s going to be hard; it’s going to be so hard!” I was bombarded with horror stories but I shook them off and answered with my usual: “I know! I know!” To some extent I had an idea that it was going to be hard, but not this hard! It’s tough, but nothing in life comes easily. All the hard work is paying off and I’ve grown so much because of it. Everything happens in its own time for a reason. Make a point of writing down your weaknesses from the start to record them. Think of ways you can improve these weaknesses and implement these techniques. Set goals to better yourself. It’s a continuous competition against your personal best each time. Having learnt so much, I would say that I realised the importance of hard work and determination... And if you really do love something so much, you’re willing to do whatever it takes. Why would you recommend this school to aspiring chefs? As Chef Jackie often says: “Do it properly, Kate”. If you are going to do something, give it your all. Aspire to be the best and be ready to work. Jackie Cameron School of Food & Wine is the best culinary school, I believe. If you want to be the best you have to be trained by the best. The quality and competence of the Jackie Cameron School of Food & Wine team speaks for itself. The course offers above and beyond a Diploma alone. Most other institutions only cover the basics of what’s required by the syllabus. Here, as an aspiring chef, you have the opportunity to really develop your skills and knowledge that, in turn, will set you apart. I desperately want to get stuck into the industry as soon as possible. Jackie Cameron School of Food & Wine offers a highly-intensive course which covers the same syllabus and more. It’s the opportunity of a lifetime. We’ve learnt more here than we have in our entire school career. Being a chef means a demanding lifestyle - why do you want this for yourself? I want it because I couldn’t imagine myself doing or being anything else. I feed off the rush and the satisfaction of what I can achieve. Food and cooking have always been my passion, and there’s no other career path that I’d rather choose. Yes it may be demanding, but it’s so rewarding and satisfying that the effort is definitely worth it. It’s what feeds my motivation to go further and to keep learning. Would Jackie Cameron School of Food & Wine be suitable for school leavers wanting to fill a ‘gap-year’- or is it only for career-minded people? Definitely for career-minded people. This industry is for the madly obsessed and passionate. It depends where the person is heading. If you’re wanting to go into nutrition, dietetics or any other field relevant to food then, yes, I would definitely recommend it because it’s an intensive course within a short period of time. So it’s suitable if you still want to study further after. I would also recommend it if you have a love for food and cooking but at the same time you’re willing to work hard, and put in the time and effort that it requires. It’s a very diverse course and you’re continuously learning, experiencing and seeing new and different things. So it’s an extremely rewarding and constructive way to spend a gap year. Most definitely! Studying the culinary arts does not only hold you down to one profession but leads to a path of many different lines and choices. What’s the worst task you’ve had to complete here? One word: Brasso – cleaning with Brasso. Brasso and I don’t have the best of relationships. The Portfolio of Evidence that we have to complete. It’s basically a record of everything you do on the course required by City & Guilds. This has to be done by all students at any culinary institution affiliated with City & Guilds. I’ve struggled to find any pathetic excuse of an answer here. But to be honest, I have never been asked to complete anything I’d classify as ‘the worst task’. When you’re able to see your own reflection gleaming back at you - yes it was well worth it. It’s definitely worth the effort because you carry it with you for the rest of you career. Pride in what you have and in your workplace. I did learn from it in the sense that it’s reflective on work that I’ve completed so it helps reinforce information. TASTE Exclusive: So you think you can Cook?